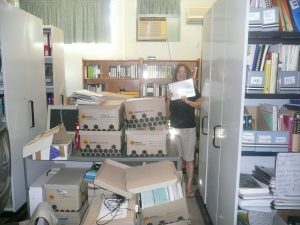 Decades after many of the language materials created at Gunbalanya were sent to the tip (only to be rescued by the local missionary and later sent to the Living Archive), a locked filing cabinet in the school (with no sign of a key) remained. Sue Reaburn was present at its unlocking and shared the story and photos with us. Although no one knew what the filing cabinet contained, it was known to contain treasures of the past. 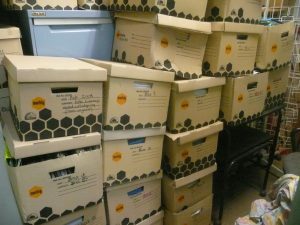 To be sure it contained nothing secret or sacred, Joseph, an elder, took each drawer down the back of the room and systematically checked through it, removing anything he thought was inappropriate for full public viewing. Among the things it contained was copies of old mission records, discs of images from the past with catalogues, old books some of them very rare related to Gunbalanya. 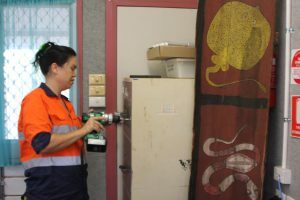 While much of it had been through a flood, that which was considered worthy of preserving digitally was bought back to Darwin to be digitised either by LAAL or the Aboriginal Education Heritage Program. 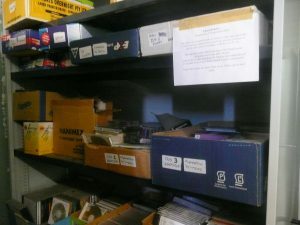 Digital copies of everything are being returned to the community, the final resting place of the important historical material is still being decided by the Gunbalanya School Council. This entry was posted in Activities and tagged Gunbalanya on June 1, 2016 by Cathy Bow. Thanks to a small grant from the Faculty of Law, Education, Business and Arts (LEBA) at Charles Darwin University, granted to the Northern Institute (Cathy Bow) and the School of Law (David Price), an expert in the area of Copyright law and Creative Commons was invited to facilitate a two-day workshop in Darwin in March. Our invited guest, Dr Anne Fitzgerald is a barrister who has practised, taught and researched in the areas of intellectual property law, internet/e-commerce law and international trade law for more than 20 years. She was a key part of Creative Commons Australia’s engagement with the Australian public sector, which resulted in Creative Commons licences being adopted as the default copyright licence by the Australian federal government. On this visit to Darwin, Anne was accompanied by another experienced IP and crown lawyer, Neale Hooper, who has also been heavily involved in the Australian arm of Creative Commons and its implementation across government departments. Workshop participants were invited from partner agencies of the Living Archive of Aboriginal Languages project (Northern Territory Library, NT Department of Education, Batchelor Institute, CDU Library), as well as other interested parties (ACIKE, ARDS, SIKPP (Yolngu Studies), iTalk Library, NAAJA, Northern Institute). There were 23 participants on Tuesday and 16 on Wednesday. Dr Fitzgerald presented a helpful overview of Creative Commons (CC) and the six CC licenses available, and how they align with copyright law and facilitate the remix and reuse of digital materials. 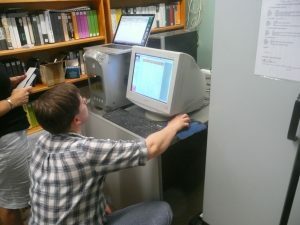 There was information about how the licenses have been used across different sectors in government and research, and some cases where the validity of the licenses had been tested and approved. There was a demonstration of some of the tools available for facilitating the use of CC licenses and appropriate attribution. David Price from CDU’s School of Law gave a useful overview of copyright law and how it relates to Traditional Knowledge (TK) and Indigenous Cultural and Intellectual Property (ICIP), which was highly relevant to the participants. The remainder of the workshop focused on specific case studies, where participants were able to share from their own experience some of the challenges and concerns they have about using CC licenses. 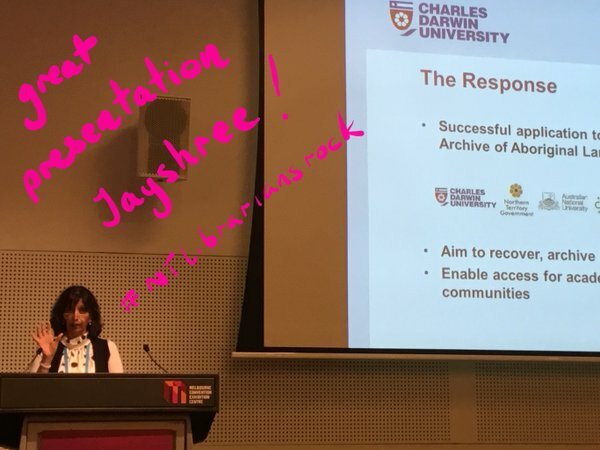 Cathy Bow shared in detail about the Living Archive of Aboriginal Languages, and the challenges involved in the decision to use a CC-BY-NC-ND license to promote engagement with the materials while respecting their integrity. Kerry Blinco from NT Library presented on their Community Stories project, and tried to separate some issues which are often grouped together, such as copyright, moral rights, ICIP, conditions of use, access control (secret/sacred/sorrow), cultural warning and metadata. Hannah Harper from ARDS presented on the importance of developing a shared vocabulary to discuss issues of ownership and copyright with Yolŋu people, before presenting a particularly interesting case about a film project which raised some thorny issues about ownership and IP. Karen Manton from Batchelor Institute spoke about the CALL collection and their focus on preservation, access, growth, promotion, and supporting community activities to preserve, maintain and revive culture and language practices. She identified some of the concerns they face in the digitisation project and the website project, and their reasons for not using Creative Commons, in order to include specific protocols. The discussion of specific projects and issues was most helpful, as it connected the general issues of CC and copyright law to specific practices, and the input from two very experienced lawyers in this area was most valuable. There is room within CC licensing to include reference to specific protocols for respecting ICIP, however these protocols are not enforceable by law. Both Anne and Neale pointed out that practice often precedes policy, as was their experience with the implementation of CC licensing with public sector information leading to official announcements about open data in government. As our projects establish best practice, we can create new norms which can then influence government policy. It was agreed that the discussion about these issues should continue, with plans for a conversation circle to meet regularly to enable ongoing work in this space. There is potential for a larger project exploring how this may happen on a wider scale. In addition to the two-day workshop, Dr Fitzgerald also presented a public lecture as part of the Open Territory program, hosted by Northern Territory Library and sponsored by the Northern Institute. The audience came from business, government and education, and were given an overview of how different sectors have used CC licensing to enable the opening of huge quantities of data, and the benefits of this across a number of areas. Thanks to our presenters, Anne Fitzgerald and Neale Hooper, and all the workshop participants for an excellent event. Special thanks to LEBA for the small grant funding which allowed the event to occur, and to the Northern Institute for their support and assistance. This entry was posted in Activities and tagged copyright, Creative Commons, ICIP, permission on April 6, 2016 by Cathy Bow. 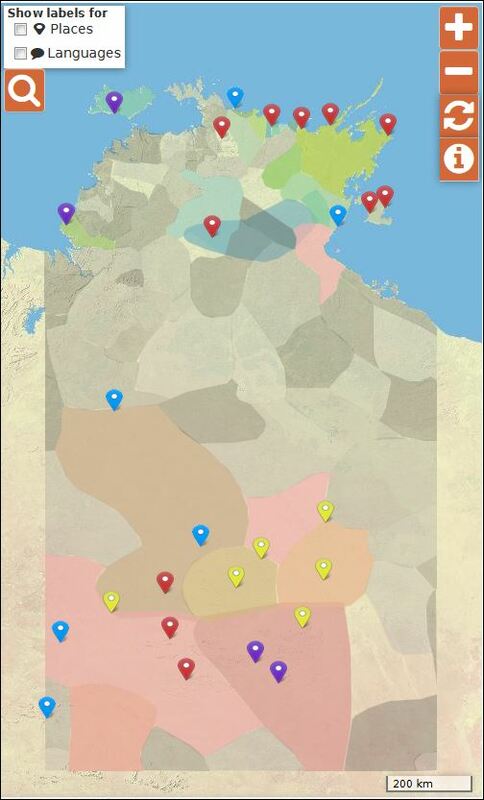 In that context it is interesting to reflect on the history of the bilingual programs in the Northern Territory and the legacy of these programs, including the books that were produced to resources these programs, to help children develop literacy in their first language before transitioning to English. 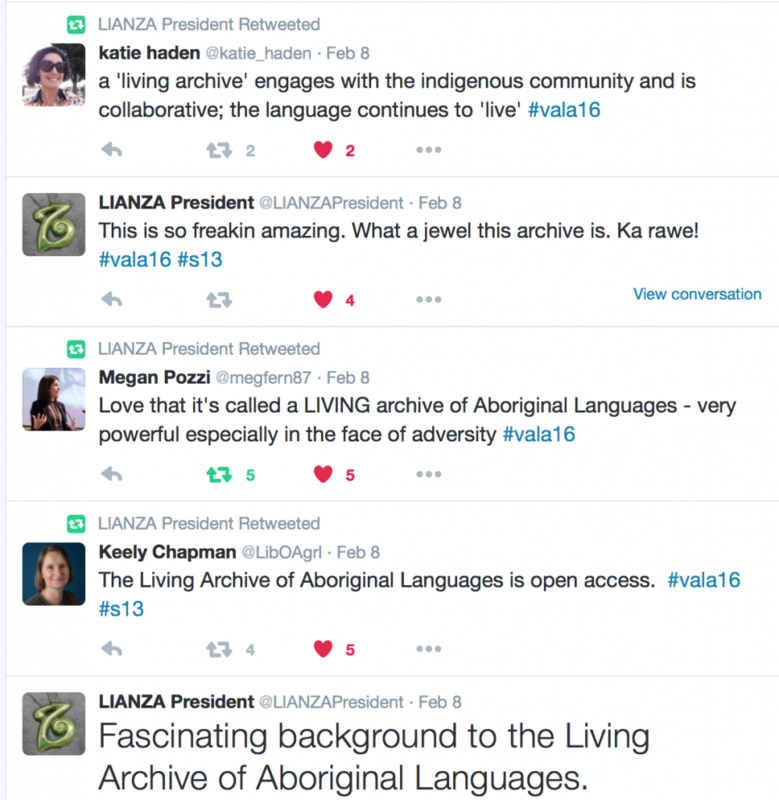 Many of these books became endangered as a result of the declining support for the program, but are being preserved and made accessible online through the Living Archive of Aboriginal Languages. 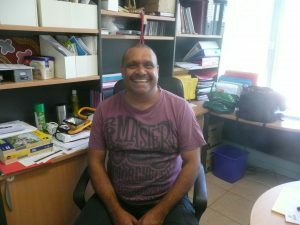 Andrew Manakgu from Gunbalanya was involved in the Kunwinjku bilingual program from its early days. Now working at Injalak Arts in Gunbalanya, he was recorded recently telling the story of the origins of that program, and about the books that were created and why they’re important. Listen to his story below and check out some of those books here. Thanks to Andy Peart for making the recording, and working with Jill Nganjmirra and Murray Garde on the translation. 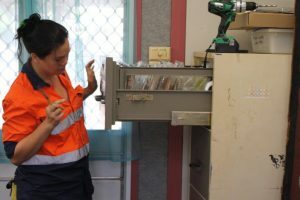 Kunwinjku and other Bininj Kunwok languages are also the focus of a new research project, which will use some of these materials to develop online teaching programs for Indigenous languages in Australian universities. A number of entries into the LAALcomp used iBooks Author to create their entries. These files only play on Apple devices but you can download them here and play them on your own device. 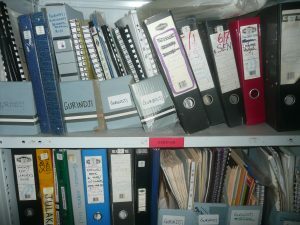 WARNING – the files are very large! This entry was posted in Activities, Media and tagged competition, school on November 30, 2015 by Cathy Bow.